10 inches of Snow on Caribbean my vacation! View - 10 inches of Snow on Caribbean my vacation! Tiger shark caught in St. Maarten waters. NO joke! 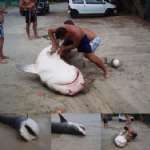 This tiger shark was caught late last week (Received this forward on Fri 8/10/07 3:20 AM) between Grand Case and Marigot. View - Tiger shark caught in St. Maarten waters. NO joke! View - Dutty wine !! Gone wrong! !